We all know cars need maintenance from the day we purchased them. However, you might not understand some of the expensive preventative maintenance services included in your schedule of services. You can find a complete list of what’s due for your specific model in a professional auto repair manual or owner’s manual. Although you can look up this information in these reference materials they won’t supply the cost. Car makers have good reasoning behind not supplying estimated prices alongside of scheduled maintenance services. As time marches on, prices change for both parts and labor. Then we must consider the geographical location of the automobile. Taking your vehicle to a dealership in California or New York City remains substantially more expensive than a repair center in Mobile Alabama. The intention of this article is to prepare you for some of the common expensive preventative maintenance services for a variety of automobiles. This way you won’t get blindsided when you hit that hundred thousand mile mark and find out the scheduled maintenance on your Lexus comes with a $2,000 bill. 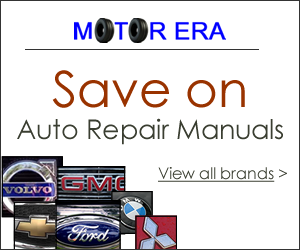 In addition to this article we supply instructions on how to evaluate auto repair estimates. You’ll need this skill. And don’t miss this article about how to get a good oil change from any retail automotive center. 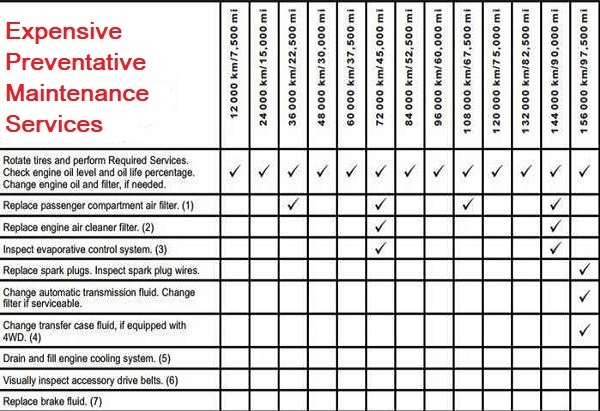 In this section we’ll take an overview of some of the expensive preventative maintenance services you’ll run into. Then we’ll take a deeper dive into each one of these large services. On older automobiles built before 1995 the first large service came due at 30,000 miles. This often included an engine oil change, changing the engine coolant, spark plugs, rotating the tires and replacing the fuel filter. More often than not the shop finds the front brakes, worn down and the need to replace the air filter at this mileage. Basically, in the old days, the 30,000 mile service became the first slap in the face to the car owner. Not only did the service run three to $500 depending on the model, but it usually came with additional work required at the same time. In the modern era of extended life car maintenance items like engine coolant and spark plugs we push this painful service down the road. However, it’s on its way and you can bet on that. On some automobiles it’s at the 100,000 mile mark now. One thing is for sure, if you keep the vehicle long enough, it will cost you more to maintain it. On some vehicles this includes replacing the timing belt at a certain mileage. On other vehicles it’s replacing all the extended life fluids. Another thing to consider is spark plug replacement on some automobiles became extremely difficult and therefore expensive. The face of regular maintenance has changed, but you’ll still find expensive preventative maintenance services on all automobiles. When people are buying a new or used car they usually don’t inquire about the timing belt situation. Keep in mind, that not all vehicles have a timing belt. 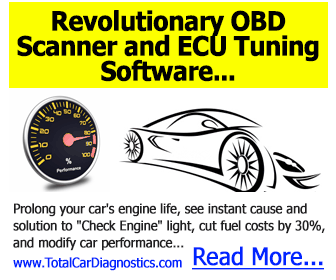 Some use a timing chain that doesn’t require any maintenance. I personally will not buy an automobile with a rubber timing belt. However, if you buy a used car you want to find out if paperwork for a timing belt replacement exists. Let’s use a popular automobile as an example of this expensive preventative maintenance service. 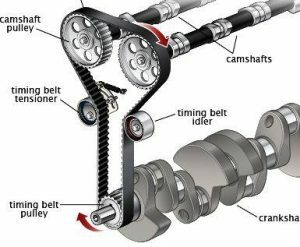 The timing belt falls under preventative maintenance, because it’s necessary to replace it even though there’s nothing wrong with it. Failure to do so can cause engine damage if the belt breaks while you’re driving. If we look at the maintenance cost for a timing belt replacement on a 1998 Toyota Camry SE we find an average cost of around $400. Applying this same procedure to a 1999 Lexus RX 300 the cost rises to about $800. Keep in mind you can adjust this average cost up or down depending on your location. In large metropolitan areas the cost goes up and in rural areas you can knock a few dollars off of these expenses. Let’s say that you always wanted to own a Ferrari. 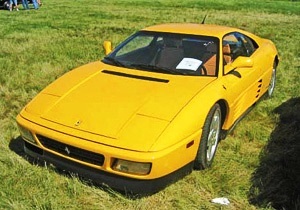 You finally find the car of your dreams, a 1989 Ferrari 348. The Ferrari builds an amazing automobile and this model is no different. Unfortunately, the engine timing belt replacement on this car is expensive. 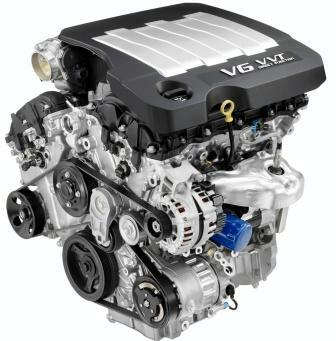 The 2.7 L engine pumps out an amazing 340 hp. However, the engine crankshaft and camshaft stay in time at high rpm’s using a long serpentine drive belt. Many Ferrari 348 owners unload these vehicles at cheap prices when they discover how much it costs to replace the serpentine cam belt. The service requires engine removal, because degreeing the cams with a new belt becomes complex. Long story short, this cheap Ferrari that you picked up now needs a timing belt service that can cost anywhere between seven and $10,000. Although an extreme example of expensive preventative maintenance services, you can see how important it is to understand the vehicles true condition before you purchase it. This goes for any brand, make and model automobile. Some of the most expensive preventative maintenance services start to show their face at around 100,000 miles. If you’re in the market for a used car you’ll find a lot of vehicles in the 80 to 90,000 mile range just shy of these most expensive services. Let’s use a relevant example as a case study. 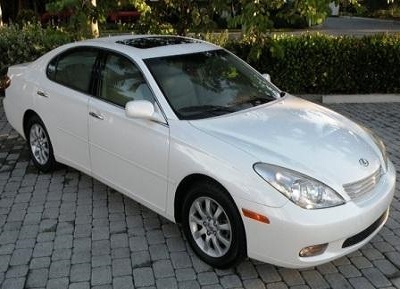 A 2005 Lexus ES 330 is a dream car for many. Now this car is well past 10 years old it seems obtainable to those on a tight budget. The truth of the matter is, if you find one of these vehicles showing 85,000 miles, it will need a $1000 service within 5000 miles of ownership. The 90,000 mile Lexus recommended maintenance schedule for this car includes replacement of the timing belt and spark plugs on top of the regular oil change and tire rotation. Let me state for the record that $1000 remains the best case scenario. On this model the timing belt drives the water pump. The dealership will probably want to replace the water pump and perform other services at the same time. Each one of these additional services drives up the cost. Some of the other things they might find include suspension items that now need attention. Front struts and rear shock absorbers often make the list of recommended items during a 90,000 mile service. By the time you walk out the door, this preventative maintenance service could cost you over $2000.